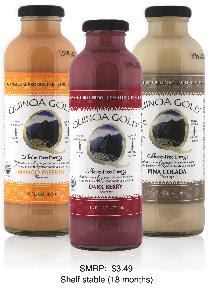 If you're looking for an alternative to Odwalla protein drinks, check out Quinoa Gold. I just drank the Mango Passion flavor and really enjoyed it -- the texture is not as thick as the Odwalla shakes and it provides great protein. The drink is made from quinoa, a gluten friendly food that is often substituted for rice in restaurants. Quinoa Gold is packed with protein and nutrients and is advertised as "caffeine energy." It's also marked gluten free! I was told about Quinoa Gold by the people at Locali, a great locally owned and operated shop in Hollywood (check out my previous post here on Locali). Free (and Gluten Free) Pinkberry!